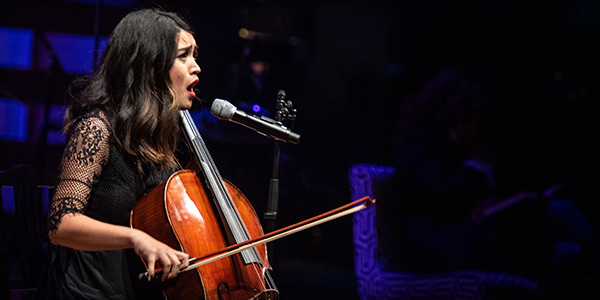 Now in its 7th year, The Syd & Shirley Banks Prize for Emerging Musical Theatre Artists provides two musical theatre artists under 30 the opportunity to advance their careers with mentorship, increased exposure and a cash prize. My experience as a Banks Prize winner has been nothing short of amazing so far. Before auditioning, the prize had been on my radar but I had no idea just how special and important the opportunity would become. The Banks Prize is held in high esteem in the theatre community, and I had a general idea of what to expect, but I didn’t fully appreciate how involved I would become with The Musical Stage Company. My experience started with UNCOVERED: JONI MITCHELL & CAROLE KING. I can honestly say that being a part of that concert is one of the most special theatre experiences I’ve had to date. There was something about the people involved, the music, the venue, and the rehearsal process that all fit like a glove. It gave me a feeling of joy from the beginning that never left. I learned so much from the concert, brushing up on the craft of storytelling through song and collaborating musically with other artists. This show pushed me further than I’d been pushed in a long time and made me grow in a myriad of ways. It isn’t exaggerating to call the experience ‘magical’. Although I felt a little blue when UNCOVERED finished, I perked right back up when we started meetings for the Banks Prize Cabaret. I’m having a great time exploring repertoire, discovering ideas and themes, and getting to know my co-Banks Prize recipient, Brandon Antonio (a mind-blowing talent!). Brandon and I are working with the incredible Sabryn Rock (director, RBC Apprentice) and Adam White (music director); they’ve provided us wonderful guidance, so I already know this cabaret is going to be a great ride! I can’t wait to share it with audiences in March. The Banks Prize has done so much for me in just a few months. Every time I think of what’s still to come, it brings a big smile to my face. Brandon and I have been given a chance to dive into the professional world and the space to express ourselves, to be fearless, and to continue to learn – for that I’m truly grateful. Don’t miss Michelle & Brandon in “Like to Be You”, the 2019 Banks Prize Cabaret, March 3-4 at the Jazz Bistro. Tickets on sale now.